There's something so amazing about the simplicity of peas. I could eat them everyday with just a little salt, pepper, and olive oil. I've always thought the television stereotype of children pushing peas around on their plate, refusing to eat them, feeding them to their dogs, and other such antics, was absurd. Who doesn't like peas? Sourdough bread on the other hand...not a big fan unless it comes in the form of a patty melt. But in this instance, there is no better bread than sourdough to pair with pea soup. The slight sourness creates a great contrast to the sweetness of the peas, in addition to adding a nice crunch to a soup that would otherwise have the consistency of baby food (I'm doing a great job of selling this recipe to you aren't I?!?). But no, really, it's amazing. Healthy, delicious, colorful, amazing. Makes for an elegant weeknight meal if you're strapped for time. I used to be an analyst at a consulting company. Basically I did a lot of data analysis, statistics, and worked a lot in SAS—for those of you who know what that is. Not the point. The point is I used to get home between 6 and 7 pm depending on the day, and most nights I would end up starving Phillip until 9 or 10 pm because I wanted to cook dinner and was never happy with simple things like spaghetti or sandwiches. It was always lasagna or tarts or fish with a side of risotto, always made from scratch of course. What was I thinking? Poor guy could have used more meals like this pea soup. If I ever go back to corporate America I'll remember that. Preheat oven to 400 degrees F. Drizzle olive oil and sprinkle salt and pepper over bread. Toss and transfer to a parchment paper lined baking sheet. Bake for 15 minutes or until golden and crispy. Let cool. In a dutch oven or stock pot, melt butter over medium heat. Add leeks, garlic, and bay leaves. Cook for 10 to 12 minutes until soft and translucent, do not let the veggies brown. Add peas, water, and salt. Bring to a simmer and cook for another 5 to 7 minutes. Don't overcook the peas or they will start turning a swampy green color and lose much of their vibrance. Turn off heat, discard bay leaves, and blend in batches until smooth. 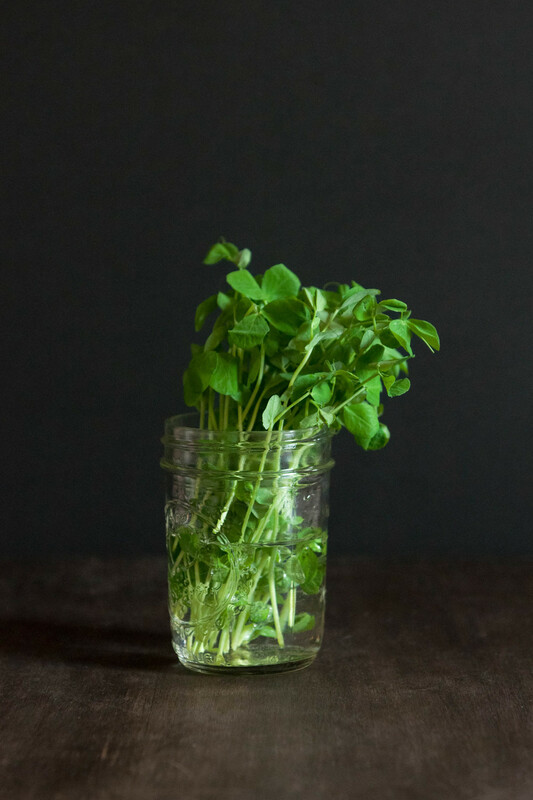 Ladle into bowls, top with croutons, pea shoots, a drizzle of olive oil and serve.